Introduce the learner to what they are going to learn. Reinforce what they have learned. Summarize what they have learned. NO MORE than three consecutive passive learner screens. Activities, videos, scenarios, & knowledge checks are all great ways to engage learners, however, interactivity doesn’t have to include ‘clicking’. Using narrative and posing questions are simple ways to involve your audience. 4 | Make it stick! Stories & examples make it memorable. And a video is worth a million. But don’t just add pictures to fill space or add decoration, use photographs or illustrations which enhance the learning and add clarity to your message. 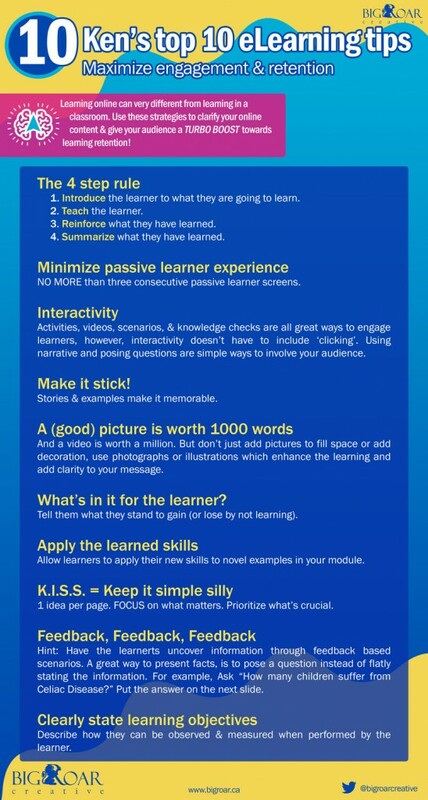 6 | What’s in it for the learner? Tell them what they stand to gain (or lose by not learning). Allow learners to apply their new skills to novel examples in your module. 1 idea per page. FOCUS on what matters. Prioritize what’s crucial. Hint: Have the learners uncover information through feedback based scenarios. A great way to present facts, is to pose a question instead of flatly stating the information. For example, ask “How many children suffer from Celiac Disease?” Put the answer on the next slide. 10 | Clearly state learning objectives. Describe how they can be observed & measured when performed by the learner.